Iceburg lettuce. Blue Cheese Dressing. Onions. Cheddar Cheese. Diced tomato. Bacon bits. Crumbly crackers. Growing up, this was pretty much what I thought salad was; bland vegetables swimming in a sea of white that was there to mask the fact that you were eating bland vegetables. It has really been in the last few years that I have really cultivated a love of salads. Part of it has been because (besides this one recipe for green beans) the only vegetables Josh will eat are salads. And, since I am insistent that he get at least SOME roughage daily we, generally, have a salad with dinner every night. Our mutual love of salad started really with the introduction of the concept that we could make our own dressing. There is an amazing store we frequented in Chicago called Old Town Oil. They carry small-batch, flavored, olive oils and aged/flavored vinegars. If you think all olive oils are the same, or haven’t branched out past vegetable oil, then get thee to a similar store… it will open your mind to the endless possibilities. We started with a rosemary-infused olive oil and a fig balsamic vinegar and never looked back. I don’t know why it took us so long to realize that we could make any kind of dressing we wanted, but that knowledge was all it took to make salads interesting to Josh. The basic salad vinaigrette recipe is pretty, well… basic: three parts oil to one part vinegar. Salt. Pepper. Emulsify. The beauty really comes in when you start mixing different types of oils and vinegars- you have your grapeseed oils, your rice wine vinegars, walnut oil, apple cider vinegar… the list goes on and on. The vinaigrette world is your oyster. Discovering the world and varieties of lettuce also opened up the door to salads for me. There is more to life than iceberg, my friends. Whether you get your salads from a sack or your garden, different greens provide different flavors. Right now, I am JAMMING on butter lettuces and arugula… both of which can be found at most grocery stores. The butter lettuce is tender with a rich taste and the arugula is a sharp peppery leaf. Together? Perfection. Even Jojo likes it! Since a salad shouldn’t be just lettuce and dressing, I find that the best way to keep your salad eating experience new and exciting is to have a plethora of extra toppings… without a crouton in sight. Since you don’t want your salad to have more calories than your main course, it is important to pick, choose, and rotate the higher calorie ones (unless they are dense super foods where the fats/calories are good for you– i.e. avocados). Although he doesn’t LOVE Chia Seeds, Josh still doesn’t object to them… which is a win in my book. A few teaspoons of Chia Seeds not only provide all the awesome benefits for which they are packed, but add a cool texture. Additionally, we also add a tablespoon of some nut (walnuts, almonds, pine nuts, sunflower seeds, pecans) for added crunch and flavor. For MORE crunch and roughage, we add chopped, raw carrots and chopped bell peppers (as these are the only other two vegetables Josh will eat). I keep a Tupperware on hand full of these two things and load our salads up with them… the theory being the more salad we eat, the less OTHER things we’ll eat (meat, starches, etc.). Here is where our salads deviate. 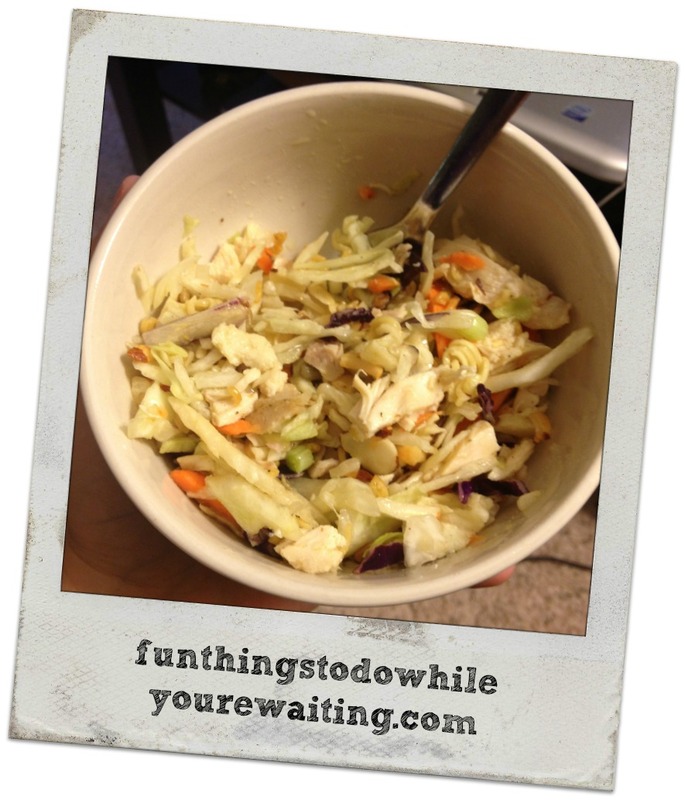 Since I LOVE vegetables and different tastes and textures, I also include broccoli slaw in my salads. This is a new item that has popped up in grocery stores the last few years. 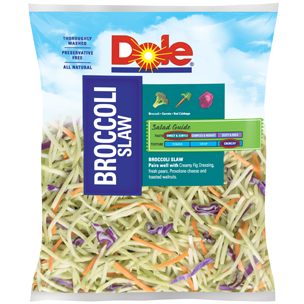 It has the same components as your normal slaw (carrots and red cabbage) but instead of lettuce, there is shredded broccoli. In the same vein, I am also loving Trader Joe’s ‘Super-8 Chopped Veggies’ blend which has broccoli, bell peppers, jicama, radishes, carrots, green/red cabbage, and celery. Since there may not be a Trader Joe’s in your area (or your TJ’s may not have the Super-8), the core concept is just MORE VEGGIES. Make your own blend and keep it on hand! The beauty of the salad is that not only is it a side dish, but it can also easily morph into a main course with the addition of a protein (or not, if you are a vegetarian… but let’s face it… if you are a vegetarian, I probably don’t have to sell you on this ‘SALADS ARE AWESOME’ idea). I love nothing more than a perfect poached egg over salad for breakfast. Additionally, we have recently started to use our cold, left-over, roasted chicken (which we shred and store until use) in my popular Crunchy Coleslaw Recipe. Not only does it utilize leftovers (which saves money) but it is SUPER yummy and an all-in-one meal. Basically, I have discovered that eating things that I enjoy (that are also healthy) is much easier than eating things I DON’T enjoy just because they ARE healthy. How do you eat YOUR salad? 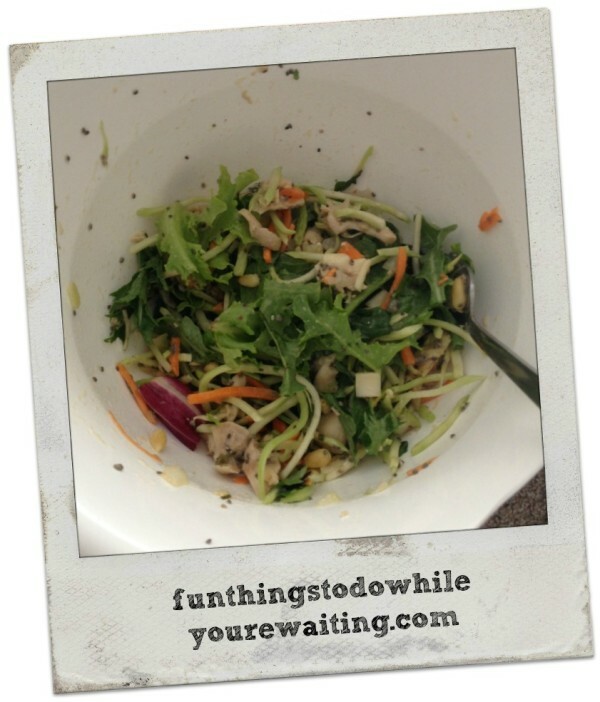 Healthy, Main Courses, Side Dishes, Uncategorized, What's Cookin'? 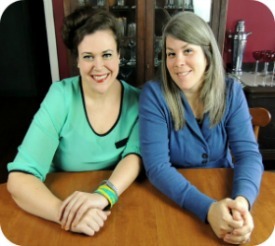 Healthy, Leigh, Main Courses, Side Dishes, What's Cookin'? Previous Article← A Wonderful Set of Muses!